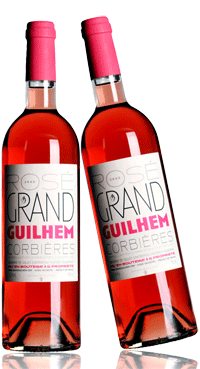 Neither sun or wind can destroy the type of wine that has been developed in this part of Southern France. An unpopulated landscape maybe beautiful but it is never really the land. Thanks to our predecessors the true potential of the earth has been harnessed to produce this unique product. It results from the work of generations of vignerons whose history culminated in the birth 50 years ago of ‘Cru Fitou, the first red wine of the Languedoc to obtain the prestigious “Appellation d’Origine Controlée” (AOC). This wine is cultivated in two areas. 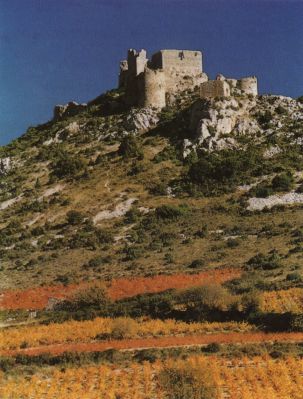 To the west it comes from an area in the Corbières Mountain region where the fortress of Aguilar overlooks the plain of Tuchan and Paziols. The other part is nearer the sea where all that remains of the citadal of Leucate are enormous blocks of stone, and at the Château of Fitou itself where there is the remains of a great wall. This was controversial territory claimed by both France and Spain and this land was fought over for many years. In the mountains the vines climb the steep slopes of narrow and enclosed tributaries of the River Berre which irrigates the land of Cascastel and Villeneuve-les-Corbières. The vegetation is that of the garrigue* and maquis**. The slopes of shale are coloured with a range of reds and greys and can be seen everywhere in this arid land where the rocks and stones shine brilliantly in the strong sun and wind. These are the climatic conditions which give Fitou wine its unity.